Bills can be approved from the Approvals page on the left navigation menu or the Bill Approvals tab on the Overview page. Tip: Have more than one bill to approve? 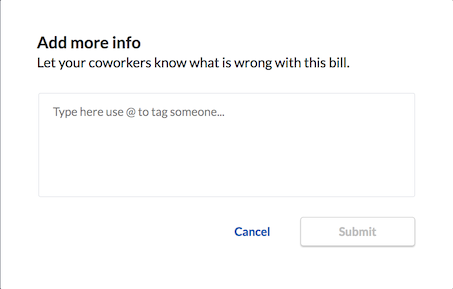 Click on a bill, approve/deny it, then use the arrows to the right or left to move to the next bill or back to a previous one. The Bill creator will be notified the bill needs review and will see the details provided in the "Add more info" box.